There are two things that may strike you as you walk past Wilton Way café. The first is the prominent La Marzocco espresso machine on the counter. The second is the “ON AIR” sign in the corner next to the window. Indeed, it is best to look out for these two as there didn’t seem to be any other sign indicating that this café was the Wilton Way cafe, home to the London Fields Radio that is broadcast from here (hence the “on air” sign). In the late afternoon, the café offered some shade on a sunny day and so we popped in for a tea, though there is seating on a bench outside should you wish to enjoy the Sun. Although this website is supposed to be about coffee (which is roasted by Climpson & Sons), sometimes a fresh mint tea is what is needed. This particular mint tea was very refreshing with plenty of mint leaves in the cup. Sadly though, in what seems to be a common pattern at the moment, this was another café at which there were few cakes on offer, presumably as it was late afternoon by the time we visited. However, what is sad for the mind is perhaps good for the waistline, we’ll have to revisit in the morning for the cakes next time. 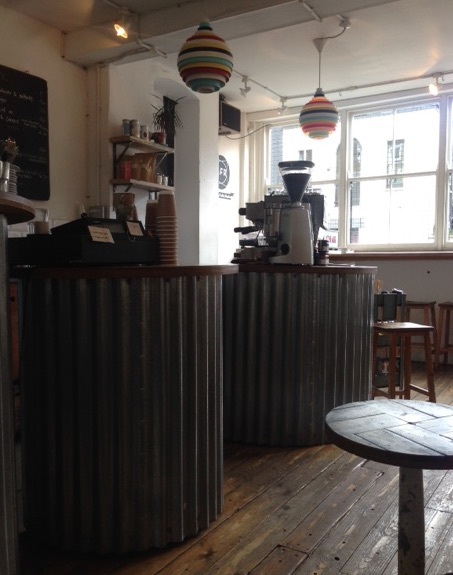 Corrugated iron supported the counter while the (plentiful) seats inside the café appeared to be made of recycled wood and boxes. 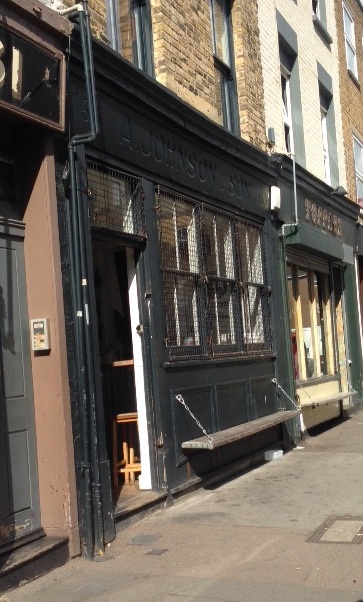 Interestingly, this is mentioned in the description of the Wilton Way café on the London Fields Radio website, apparently the interior was designed to be a mix of modern and reclaimed materials. Choosing a seat at the back allowed us to survey the space and people-watch while sipping the tea. 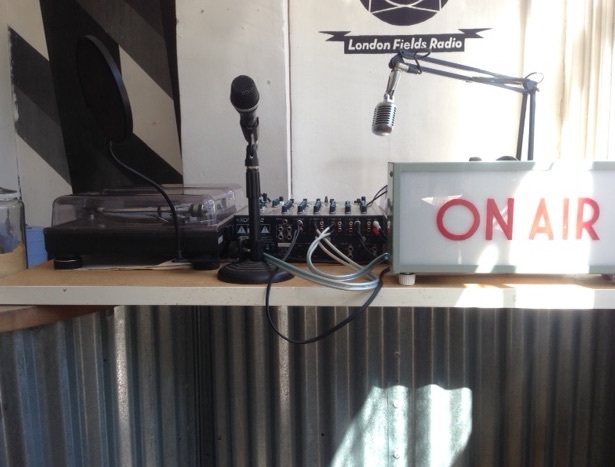 On the counter was an old-style Casio cash register while in the far corner at the front of the café, the microphone and broadcasting equipment stood waiting to be used for the London Fields Radio. In the book “Radar, how it all began” the author, Jim Brown reminisced about how he had played with a crystal radio set as a child in the 1920s¹. Many scientists can remember making their own radio sets as children (or indeed as adults). It seems playing with things, taking them apart and building them again is part of the personal-history of many scientists and engineers (particularly experimental ones whether they be ‘professional’ scientists or not). The Lunar Society (which was active at the end of the eighteenth century and into the early nineteenth) featured a group of keen “tinkerers”. These were people who experimented with nature and invented new devices in order to explore their understanding of the world. Though each of them were only doing science ‘on the side’ as they each had other day-jobs, individuals within the group did make some important contributions to our understanding of the world. One such contribution was by Josiah Wedgwood who by observing the “waviness of flint glass” noticed its resemblance to “that which arises when water and spirit of wine are first put together before they become perfectly unified”². The reference is to mixing fluids of different density. Isn’t this experience of tinkering with things similar to our enjoyment and appreciation of coffee? The more we experiment, the more coffee we try (including cupping coffee as with this how-to from Perfect Daily Grind), the more deeply involved in coffee we become and the more we value it. Isn’t it actually true that in order to deepen our relationship with coffee we need to explore it (and experiment with it) more fully? Cannot the same be said for our relation to our world? The view from the corner. Spacious and quirky, the Wilton Way cafe has plenty to offer the coffee (or tea) drinker who wishes to slow down and appreciate the moment. But then a second thought that, to some extent flows from the first. No development would be possible without a community, each contributor bringing a different talent but each contributing to an idea of a greater good. The London Fields Radio would not be possible without the scientists and engineers who design and optimise the broadcasting (and receiving) equipment. But neither would it be possible without talented DJs and musicians, thinkers, poets and performers to give us something to listen to. Two more groups of people are needed for London Fields Radio to be a success. Those who provide the space for the broadcasting equipment (i.e. the café) and those who listen in. Again there is an analogy with coffee. No cup of coffee could be there for us to enjoy without the farmers, the traders, the roasters, the baristas and finally many other people like us who enjoy a good cup. And the more each of us tinker with appreciating another’s work (cupping the coffee like a roaster or tending an allotment to appreciate the growth), the more of a community we become and the better coffee we get for it. We do not imagine while ‘cupping’ coffee that we are really about to take on the role of the coffee trader or roaster, yet by playing at their job we can appreciate their importance and skill more and so realise more effectively our own role too. We could go full-cycle here and consider how playing with radios and experiments can help us to understand the role of technology and science in society and our participation in it, but perhaps that is left as a point to ponder in another café: How can we each contribute to a better society, understand our role in it and appreciate the contributions of others? One final thought that came from the Lunar society but appears to have a very contemporary relevance. Wedgwood once said to Richard Lovell Edgeworth “But in politics… as in religion, hardly any two people who thought at all, thought exactly alike on everything.” The main thing was “to agree to differ, to agree on impartial investigation and candid argument”.² It appears the Lunar men still have a thing or two to teach us.